While I enjoy a little silence now and then, like when I stand still in a snow covered field on a winter's night, I also enjoy the sound of snowshoes as they crunch crunch crunch their way around a frozen field. I enjoy the silence as I stare through the eyepiece of a telescope and I enjoy the noise of barred owls calling and coyotes howling as I peer at the stars. While I enjoy the soundtrack, silence can be thought of as the true sound of space. In the vacuum of space, sound waves cannot travel so silence rules the day. That's why I was happy when the firefly class ship Serenity silently glided past Reaver ships in the movie Serenity. I'm a science geek at heart and I like my space scenes quiet. All is not lost though for those who like sounds. We live in a universe of vibrations. More and more, little bits of information come across my desk that have to do with sounds in space. One of the reasons space can seem so cold and boring is that much of it is cold and boring. Sounds excite us. So, in an effort to make space a little more exciting here are some sounds from space. This is a new field so the offerings are a little meager but keep in mind the first recordings on earth weren't real exciting either. The first sounds from space I ever heard were pulsars. A pattern will become clear soon that all of these sounds are a bit of a tease. You can't really "hear" a pulsar. These are radio waves emitted by spinning stars. A computer turns them into sound for us. 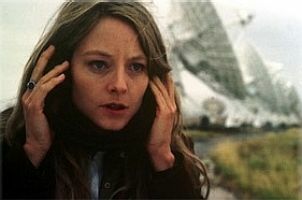 I heard sounds like these on TV shows about space as a child and thousands of people heard them in the movie Contact when Jody Foster's character thinks one might be an alien signal early on in the film. In fact, the one linked above sounds a bit like the one in the movie. She says it is J1741+2748 which isn't a real pulsar. It was years until I heard another sound from space. It was the cassini spacecraft traveling through Saturn's rings. The accompanying animation gives some nice perspective. Millions of tiny particles hit the high gain antenna creating puffs of superheated plasma that the Radio and Plasma Wave Science instrument recorded. The Cassini spacecraft collected these bizarre radio waves near Jupiter. They sounds like birds. This is an example of a chorus sound caused by radiation belt electrons in a planet's upper atmosphere. Cassini also recorded the sound of auroras at Saturn. Check out these weird radio emissions the Galileo spacecraft gathered from Jupiter's largest moon, Ganymede. Here's the sound of the Voyageur 1 spacecraft hitting Jupiter's bowshock. I like the sound of this one. If you want an explaination look here. Keep in mind this is an audio representation of data. This one is cool though because the waves are technically in the audible range so this is closer to actual "sound." Last two sounds. How about the Big Bang? Or did it sound like this? Technicaly this is the sound of the universe cooling just after the big bang. The other day I stumbled upon the Planetary Society website and saw that they are attempting to send an actual audio recorder to mars. Now we're talking. Real sound! Unfortunately, they put the recorder on the polar lander which crashed. Now that would have been a sound to record!